We haven’t had as much time to cook recently… but the one thing we have been doing consistently is making and eating pizza. I have been making a bunch of pizzas and wanted to try to something a little different. This past Friday I tried making two different “innovative” pizzas. I will post the second one in a little. Both of them were surprisingly tasty. This recipe is not too precise, and the quantities are not too exact. I made it all up, so clearly there is a lot of room for innovation here. Make up a batch of the pizza dough, which makes two crusts, and give both of them a try! Place a pizza stone on the lowest rack in your oven and preheat the oven to 500 degrees, or higher if it can do it. Start cooking the onions over a medium-low heat in a non-stick pan with a bit of olive oil. You want the onions to slowly cook until they become soft and start to turn tan. Soak the figs in a bit of water or wine if you have it on hand. Place your shaped pizza crust on a peel dusted with cornmeal or flour. Once the onions are done, spread them on the pizza crust. 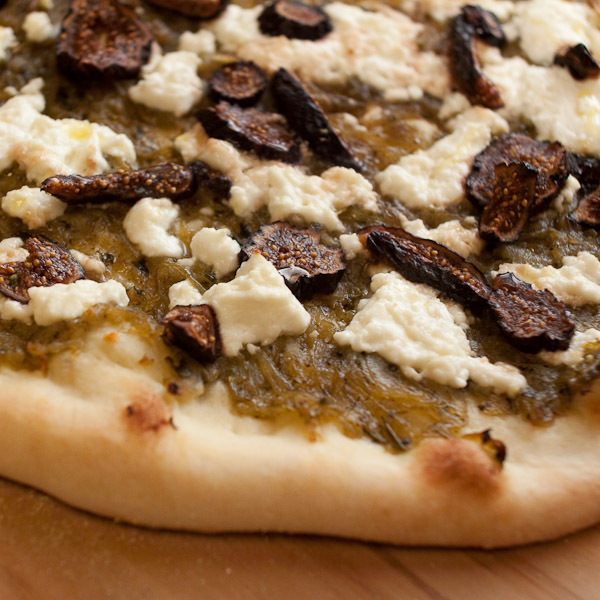 Add pieces of goat cheese to the pizza. Drain the figs and then add them. Once the oven has preheated, slide the pizza off the peel and onto the stone. Cook until the crust has browned and the cheese looks melty. The trick to this dough is using a hot oven and lower protein flour. The hot oven & pizza crisp the crust while still keeping the interior tender. Mix everything together and then dump everything onto a well floured surface and knead. Dust with more flour if it becomes sticky. If you are making the pizzas later you can refrigerate the dough for about a day or so. Adjust oven rack to lowest position, set pizza stone on oven rack, and heat oven to 500 degrees. Divide dough in half and shape into smooth, tight balls. Place on floured counter or baking sheet, spacing them at least 3 inches apart. Cover with some oiled plastic wrap or a towel. When dough balls have doubled in size, dust dough liberally with flour and transfer balls to well-floured work surface. Press one ball into 8-inch disk. Pick up the disk by the edge and slowly rotate, moving around the edge. This should allow the pizza to stretch under its own weight. Continue until it is about 12″. Dust a pizza peel or piece of cardboard with corn meal or flour, then transfer dough to peel. If you add some prosciutto, it adds an extra layer of flavor and OMG! Makes the original wonderful pizza wonderful x 2! Yum! I use those same ingredients (minus the pizza dough) to make a tasty dip/spread. The goat cheese, caramelized onions, and figs all go in a crock, then get baked in the oven til bubbly. Serve with crackers or sliced French bread. Tasty! I should have thought to put it on pizza dough! Will have to try! 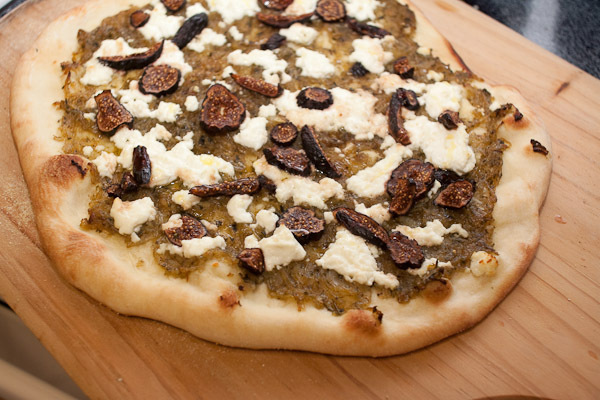 That is an awesome idea… I think we have figs and goat cheese left over. Thanks! Wait. You cook the onions, then soak them in water? Is that right? Or did you mean to soak the figs? You are totally right, that should say “Soak the figs”. Just fixed that. Thanks for catching it!